Today's photo is a book that I've been reading lately. I had the good fortune of hearing Salman Rushdie speak at Bellarmine University while I was a student there. What he had to say about freedom of speech has always stuck with me. He said that once, during the fatwa years, a terrible film was made about him and they wanted to show the film in Britain. The film council wanted to block the movie, but Mr. Rushdie spoke about how freedom of speech means that everyone has the freedom to speak, not just those who we agree with. In the end, the film was shown and no one came, because it was rubbish. If he had allowed Britain to block the film, the controversy would have made the film a bigger deal. I continue to see the relevance in what he said in the headlines of today. 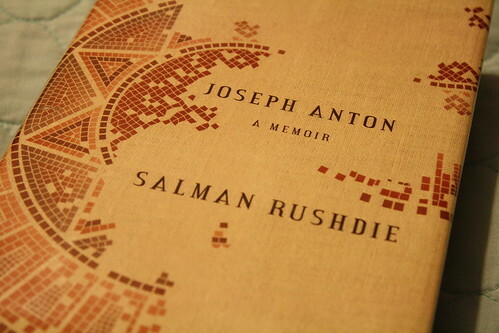 He recounts that same story in "Joseph Anton," his autobiography. I really enjoy learning more about his life, his writing, and all the famous writers and politicians that fill the pages of this book. It is so interesting to hear the story behind it all, told with so much humor and skill.